← Are home schooled students really in school? 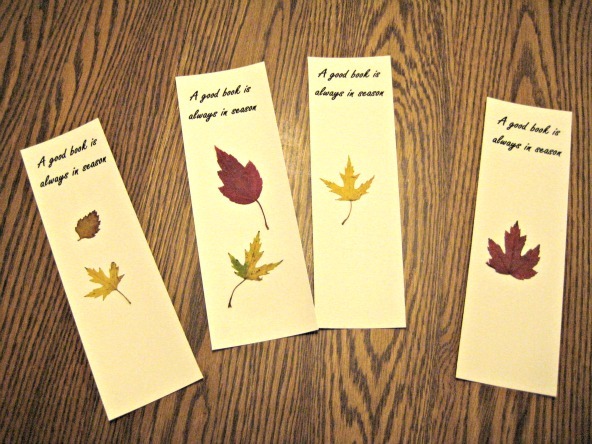 I own a couple pressed leaf bookmarks from a dear friend — she included a Bible verse about friendship on the flip side. A nice reminder of our times together, and of the season. I made my own bookmarks recently. Without a Bible verse. I’m not a heathen, if you’re wondering. I always have pressed flowers and leaves. If I open any book, large or small, I’ll probably find a leaf or flower between the pages. Cookbooks, the dictionary, a reference book, the phone book. I own a leaf press, but it only holds a few leaves of a certain size. And if the flower is juicy, I have to replace the paper. While the best storage for my pressed leaves and flowers is in the press, I do have other storage — envelopes. I try to group like specimens in the same envelope. I imitated the naturalists in our area by using contact paper to preserve my leaves (autumn or not) instead of laminating as my friend did. The leaves will stay beautiful indefinitely, and the paper is acid-free. Place mats would be a similar, large format project if you have say, sycamore leaves. OK, that’s borderline ridiculous in size, but a mature maple’s leaf would work well. I love saving the temporary, all-too-quick-to-disappear nature of autumn leaves. Leaf crumbs are annoying, so sandwiching in contact paper is good for me. This entry was posted in crafting, home schooling. Bookmark the permalink.